Newport Aquarium’s young loggerhead sea turtle is not camera shy. Most parents can agree that infants can be quite the handful. Between changing diapers, feeding, calming down cries, and burning off their energy; caring for a baby is a round-the-clock venture. Aquatic Biologist Jen Hazeres and her assistants face similar realities while rearing Newport Aquarium’s six-month-old loggerhead sea turtle. Our young loggerhead has displayed playful behavior and a curious attitude during her time at Newport Aquarium. She is a growing ball of energy, which was why she was moved from a 90-gallon tank to a 250-gallon tank on Jan. 7. She is extremely close to going on exhibit, which will help her mental growth as she learns to interact with other animals in a new environment. 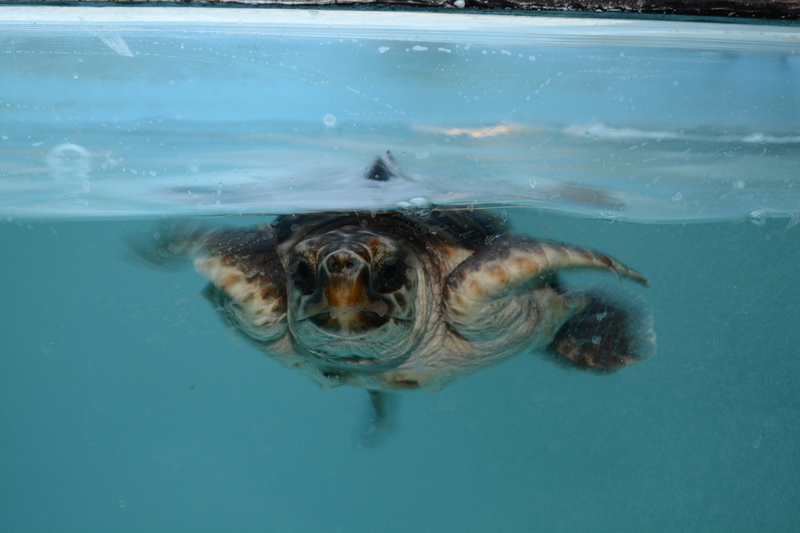 Most times when our baby loggerhead is taken out of her tank, she can be seen tirelessly waving her front flippers. Exactly three months to the day her weight was recorded (70 grams) at Newport Aquarium for the first time, she weighed in at 664 grams (1.46 pounds) on Jan. 27. She is getting wider, but the goal is take sure her width coincides with her length so she doesn’t become overweight. As long as Newport Aquarium husbandry keeps the loggerhead’s weight on target, “This turtle is going to be just fine,” says Hazeres. 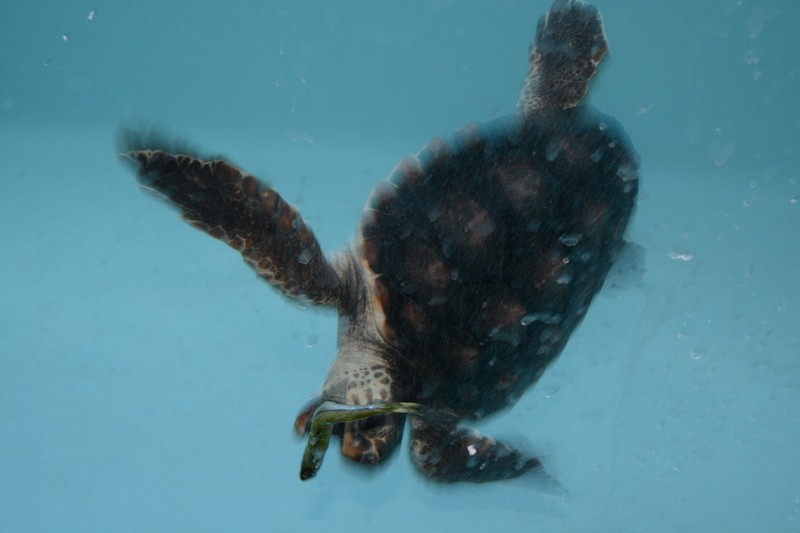 To help the loggerhead continue to gain the proper weight, she is currently being fed 10 grams of food twice a day. In the morning she eats a clay substance filled with vitamins and minerals. In the afternoon she gets to snack on small animals, such as silverside fish, and never leaves so much as a crumb – a sure sign of positive physical growth. Eating a silverside fish head first is a positive sign that the young loggerhead is more comfortable with her swimming abilities. She does not mind the clay food in the morning, as evidenced by last week’s video of her scarfing down her breakfast in one minute. This entry was posted in Turtles and tagged Sea Turtles, turtle, turtles by NewportAquarium. Bookmark the permalink.